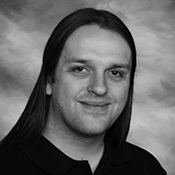 Marcus D. Hanwell is a Technical Leader in the Scientific Computing group at Kitware, Inc. He leads the Open Chemistry project, developing open-source tools to for chemistry, bioinformatics, and materials science research. He completed an experimental PhD in Physics at the University of Sheffield, a Google Summer of Code developing Avogadro and Kalzium, and a postdoctoral fellowship combining experimental and computational chemistry at the University of Pittsburgh before moving to Kitware, Inc. in late 2009. He is a member of the Blue Obelisk, blogs, @mhanwell on Twitter and is active on Google+. He is passionate about open science, open source and making sense of increasingly large scientific data to understand the world around us. Science is not an exclusive realm limited to people in white lab coats with Ph.D.s, but rather a way of thinking applied to everything from advanced computational simulations on nuclear material to brewing an award-winning beer. However, current scientific practices are undermining the very progress and innovation they were designed to stimulate, bringing us to the brink of a crisis. The lack of openness, access to data and methods, and opaque review processes have created a system that threatens the very foundation of scientific reasoning.